If I had to pick just one picture of me that I like the best, it would have to be this one. I believe that it was the summer of 1980 after I had joined the Coast Guard and flew back to Virginia to visit Bob and Elaine. 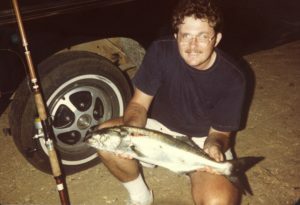 I’m sure there will be other stories about this trip, but here, Bob and I were going down to the Chesapeake Bay to go out on a chartered boat to catch Bluefish. We drove down in the afternoon and had planned to sleep in the back of his Bob’s truck so that we could get underway early. On the way down, Bob made a quick detour to a little beach where we threw out our lines in the surf just to see what would happen. Sure enough, in no time at all, I had this really nice Bluefish. The fish was only 4 or 5 pounds, but I think that you can tell from the look on my face that it was pretty special . This was one of those fortuitous experiences. Steve came to visit us in Virginia at the same time as some of my workmates had arranged a bluefish charter on the Chesapeake. We could get up early and drive directly to the boat, but I thought that it would be fun to sleep on the beach and maybe catch a bluefish from the shore. We set up surf casting poles with bells, laid back to watch the soft humid night pass, and Steve caught a very nice blue. Later that day, we went on the boat, caught 20 or 30 fish each in a lot of action. However, the fish that Steve remembers was the one that bit while we were laying back in the sand, dozing and gabbing. I’m glad to have had that time together. At one point in my life, fishing was an all-consuming passion. I’ve apparently moved on, but this one photo, captured me. I’m realizing now that there is a lot more that I need to write about my various passions.